Super luxury passenger vessel M.V. Marella Discovery of Marella Cruises, with 1,732 passengers and 764 crew on board, made her maiden call at the Port of Colombo in December 2018. 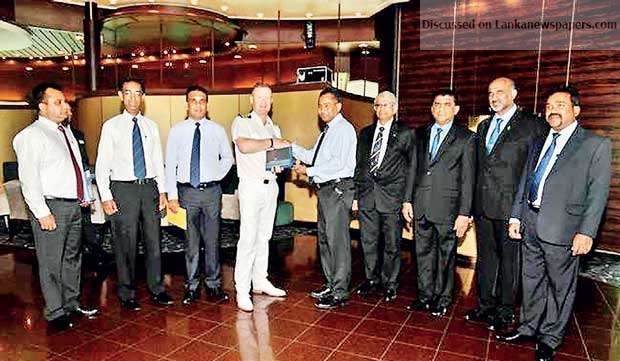 In order to mark the maiden call of the vessel at the Port of Colombo, plaque exchanges were held between the vessel master, Sri Lanka Ports Authority (SLPA), local agent Aitken Spence Shipping Ltd and travel operator Aitken Spence Travels Ltd.
On behalf of the SLPA, Managing Director Capt. Athula Hewavitharana exchanged plaques with Marella Discovery Master Capt. Christopher N. Dodds. Aitken Spence Shipping Managing Director Iqram Cuttilan and Aitken Spence Travels Managing Director Nalin Jayasundera exchanged plaques with Capt. Dodds on behalf of the Aitken Spence group subsidiaries. Expressing views at the occasion, Hewavitharana said that the Port of Colombo is honoured by the presence of Marella Discovery in Colombo. Marella Cruises (formerly Thomson Cruises) is a British cruise line offering cruise holidays around Europe, the Caribbean and Asia. Marella Discovery is approximately 264 meters in length and 32 meters wide, having 902 state rooms with a capacity to accommodate up to 2,074 passengers. The excursions organised by Aitken Spence Travels had over 1,000 passengers joining in to enjoy the city and immediate locations of Sri Lanka, such as the Colombo heritage walk, exploring the city of Galle and Sri Lankan river safari. Marella Discovery commenced its voyage from Europe, calling at Italy, Crete and moving on to Egypt, Jordan, Oman, the UAE and several ports in India on her way to Sri Lanka and will thereafter cruise towards Indonesia, Thailand and Malaysia. The vessel that cruised under the flag of Malta called Colombo from Cochin, India and Sabang, Indonesia is her next port of call. Established in 1868, Aitken Spence PLC marks its 150th anniversary. The company has grown to great heights, especially with the diversification of the company in 2004 into non-traditional areas. The company’s involvement in port efficiency enhancement projects in new markets has helped to successfully pursue a long-term directional shift from being service-related to becoming an investment-driven operation.